Michael Lee Willcuts was born in Los Angeles, California on September 5, 1966. His Lakota name is Tatanka Woslal Mani - Standing Upright Buffalo. Willcuts is an enrolled member of the Cheyenne River Sioux Tribe; he belongs to the Minniconjou band of the Lakota Nation. Willcuts’ ancestral lineage includes his great-grandfather Red Hair, who was a keeper of the Sacred Calf Pipe and whose sister was Crazy Horse’s mother. His great-grandfather was a member of the Elk Head Clan. Willcuts' grandmother, Annie Yellowhawk, is the last living member of this clan. The artist attended Central High School in Rapid City, South Dakota and Channel Island High School in Oxnard, California. He went on to attend Oxnard College in 1985-86. From 1986-88, he attended the South Dakota School of Mines and Technology in Rapid City where he majored in Fire Art and minored in Commercial Art. Willcuts returned to California and attended Ventura College in 1990 and El Camino College in Torrence in 1991. Returning to South Dakota in 1993, Willcuts attended Black Hills State University in Spearfish, pursuing his B.F.A. degree. Willcuts is in the vanguard of a new and innovative breed using a now accepted fine art medium, airbrush. He is one of the few Native American visual artists to experiment and develop what was once a tool used primarily in commercial art. Already, Willcuts has polished and mastered a style of razor-sharp clarity with much enthusiasm. As an artist, Willcuts has participated in notable exhibitions such as the 1990 Ventura Cup Regatta. There, he won a certificate of professional merit for a poster he designed. His work was also included in a one year exhibition at Ventura College. In 1992, Willcuts entered a student design and photography show at Black Hills State University where he also placed second in illustrations. Willcuts is confident when he says how much he loves his career and sincerely considers his talent a gift from God. He wants to provide everyone with a glimpse into the history of his culture and the spiritual relationship he has with the earth. Presently, Willcuts live in Rapid City, South Dakota. 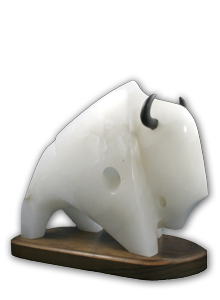 Willcuts' artwork is available through the Akta Lakota Museum online gallery.